This salad has been a family favorite for a while! I love to bring this to parties or simply eat as a wonderful lunch or side dish. I like to add blueberries or strawberries to this salad for color and flavor. 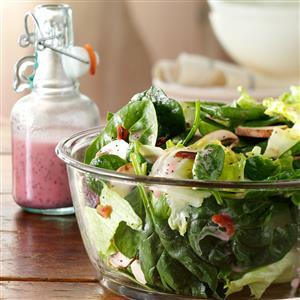 In a large bowl, combine spinach, lettuce, mushrooms and bacon. Place vinegar, onion, sugar, salt and mustard in blender. While processing, gradually add oil in a steady stream. Transfer to a bowl; stir in poppy seeds. Divide salad among six plates; drizzle with dressing. Yield: 6 servings (1 cup dressing).